Working and sewing in pyjamas is just one of the secrets behind the success of fashion label Alice Nightingale – created by the one-and-only Ms Alice Nightingale. 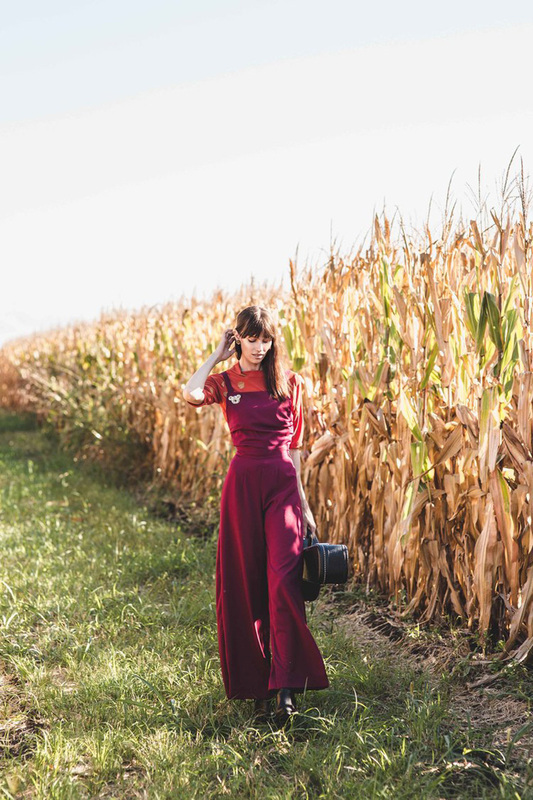 She has a strong focus on sustainable fashion and a penchant for salvaged vintage finds and breathing new life into them. We are going absolutely gaga over Alice Nightingale’s gorgeous threads – and we’re pretty certain you will too! Have a read about how this delightful chicky* owns and runs her own fashion label. *incredibly talented and wonderfully humble (don’t mind the gush)! Where did you get the idea to begin your own fashion label? I’ve always been obsessed with pattern making and sewing, the more hands on the better! The idea of becoming a designer and starting my own label really grew from this love of creating. When I graduated from AICD (Australian Institute of Creative Design) in 2009, I didn’t find the typical fashion business model of sending my designs overseas to be made in bulk at all appealing. I love the entire design process (cutting and sewing included) and have learnt from creating every single day that quality comes from knowing my garments inside and out. Alice Nightingale really started from this idea of producing my garments myself; I found it easier as a young designer to change my designs from chatting to customers at markets and also from wearing my pieces everyday! 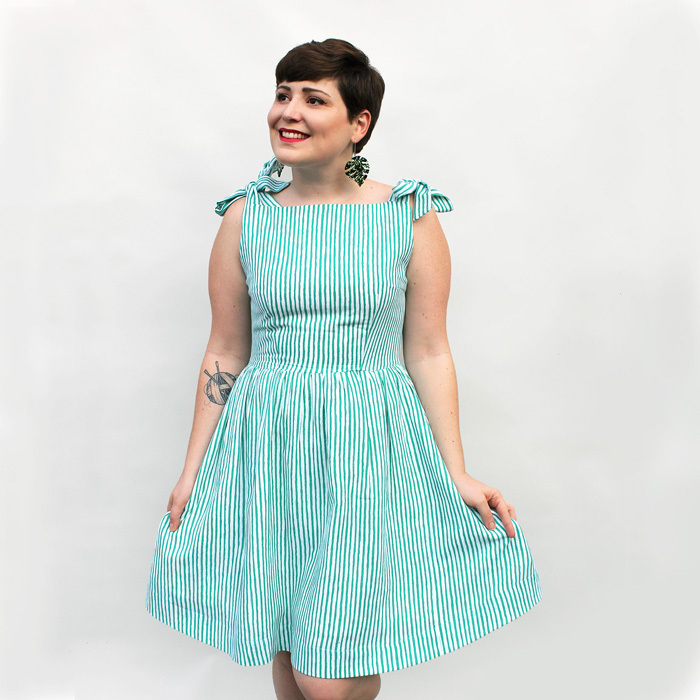 Why do you think a focus on handmade and ethical clothing is important in fashion? Supporting handmade and ethical design impacts your local and international community in an amazing way. Quality garments have a longer life, will wash well and won’t go straight to landfill. Locally made clothing has very low shipping emissions and, in my case, has been made in very small batches and supports your local economy. Ethically accredited clothing made overseas creates better jobs and communities in areas facing great hardship. On all levels, buying handmade and ethical gives you a 100% chance of feeling warm and fuzzy at the end of the day! My designs are very much vintage inspired, with lots of Australiana detailing. I’m a massive fan of native flora and fauna; there are so many beautiful species to choose from as an artist. I’m finding native floral embroidery sits perfectly on the pockets of a 1960s inspired skirt, or that little wombats look too sweet on the collar of a 1950s button up blouse. It’s a match made in heaven. Describe your workspace. Why do you love working there? Busy, colourful and generally cluttered! As I only make a handful of each design, there’s a constant rotation of fabric and trims on my tables. I’ve always worked from home, which is perfect as I’m prone to becoming wrapped up in whatever garment I’m working on and I forget to get dressed! I’m currently working through fabrics and trims I’ve inherited from my grandmother, this means my studio is currently a mess of retro buttons, embroidery thread and fabric from every decade! What are your top three favourite artists to listen to while you work? I love listening to Laura Marling – her new album is so strong and feminine, great for a solo business lady! I also listen to local gals All Our Exes Live in Texas a lot; their beautiful songs are full of hilarious stories and heartbreak. Podcasts also feature heavily while I work, as I’m always alone in the studio and like to have conversations and stories to keep me company. How can we be more conscious consumers of fashion? The main tip I have for anyone who wants to start buying ethical is to consider the life of the garment you’re buying. Is it something you’ll want to wear every week? If so, will it wash well? If you decide in a few years time to part with it, will it still be good enough to resell or donate? On top of avoiding clothing going straight to landfill, get researching! 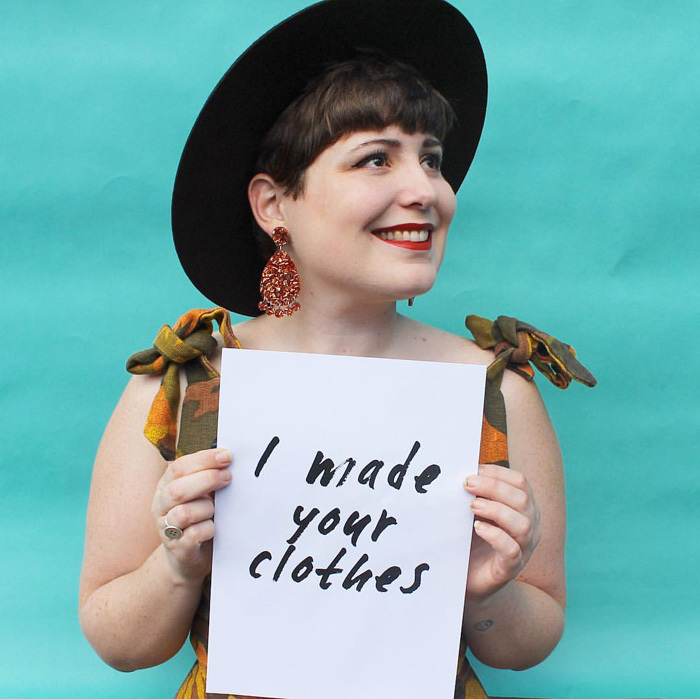 Ask your favourite brands who made their clothing, look on their websites for any accreditation, see if they took part in Fashion Revolution Week and be sceptical of factory self-assessments. What’s the best thing about running and owning your own business? Did I mention not getting dressed? On top of that, I have a lot of freedom with my designs and am really only limited to what fabric I find. I’ve always loved the ability within my label to not only oversee, but also create every part of my designs! What’s the hardest thing about running your own business? Making and selling clothing can be a very up and down business! Other than the income uncertainty, I work very long hours and balancing a social life can be difficult at times. I’m very lucky to have a supportive partner and a group of friends who have, not only stuck by me over the years, but are also busy running their own businesses or making amazing strides in their careers. You see them when you see them, but they’re always there for you! Do you have any words of wisdom for our readers on starting their own fashion label? Be transparent. Social media is a massive part of every small business nowadays. It’s also a great tool for showing how and where your clothing is made! Also work as hard as you need to work, don’t let anyone make you feel bad for putting in long hours or missing events as you start up – you’ve chosen a career you’re passionate about and that should only garner respect from those around you! 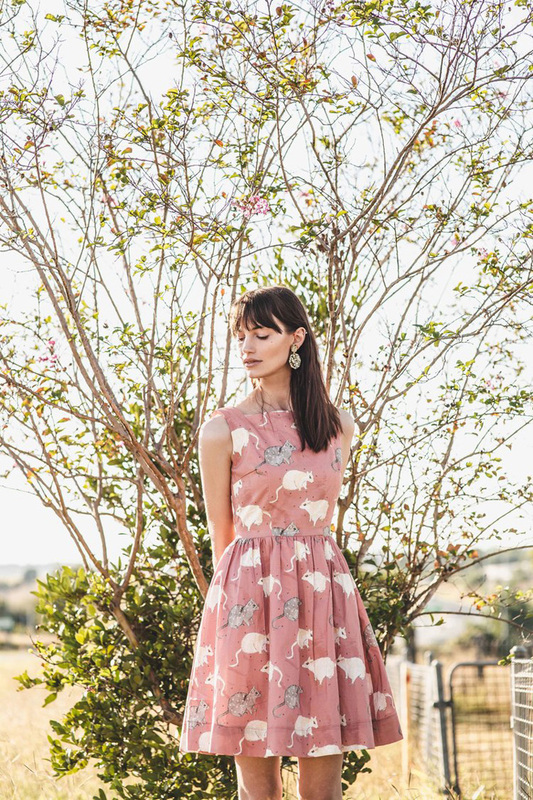 Head along to the littlewren Instagram to be in the running to win one of three of the above Alice Nightingale dresses. Also keep up to date with everything Alice is up to on her Instagram @alicenightingale or shop her beautiful collection on Etsy.